Saturday, July 21. 10:00 am – 1:00 pm. 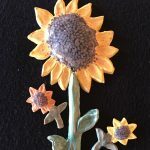 For this family friendly AND Series, we will be playing in the clay studio and creating ceramic sunflowers that will be the perfect addition to your outdoor decorations. Work will be fired in our kilns and available for pick up one week from event. $35/parent & kid, $15/additional person. Open to ages 8+. Pre-registration is required. Instructor: Kathleen Cortner.